Since we posted our popular chart 'iPad apps for students with special needs', we forgot to to share another chart for Android users until we have recently been reminded by one of our readers. 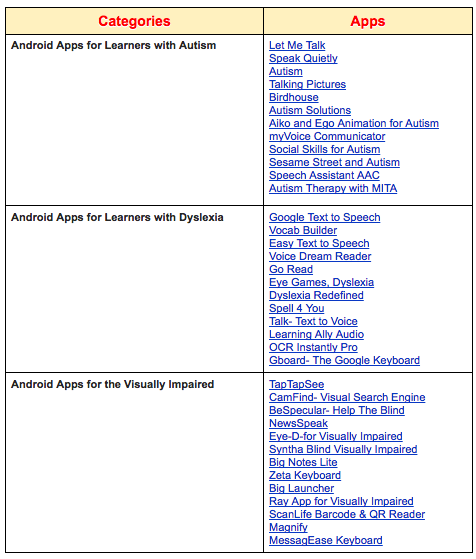 The chart you see below is a collection of some good Android apps we curated from different sources (see links below) to help individuals with special needs make the best of their learning using an Android-operated mobile device. We have arranged the apps into three main categories: Android apps for learners with autism, android apps for learners with Dyslexia, and Android apps for the visually impaired. If you have other suggestions to add to the list, please share with us in our Facebook page.